Order of 'Harry Potter' Movies: Most Popular? In North America, Harry Potter and the Deathly Hallows: Part 1 is no. 3 in number of tickets sold on opening weekend, behind Harry Potter and the Goblet of Fire and Harry Potter and the Sorcerer's Stone. It could be even further behind if IMAX surcharges are factored in. 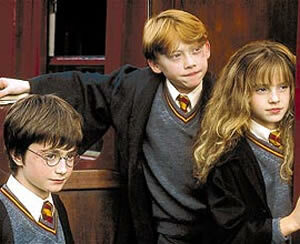 Harry Potter and the Sorcerer's Stone remains the most popular movie – in number of tickets sold – in the Harry Potter franchise. The Harry Potter movies that opened during the summer season in North America were the weakest performers. The Harry Potter movies are, relatively speaking, much more popular overseas than in North America; international receipts represent about two-thirds of the films' worldwide box office gross. Adjusted for inflation, four Harry Potter movies have passed the US$1 billion milestone worldwide: Harry Potter and the Sorcerer's Stone, Harry Potter and the Chamber of Secrets, Harry Potter and the Goblet of Fire, and Harry Potter and the Order of the Phoenix. In North America, the number of tickets sold for each Harry Potter movie has – with a couple of exceptions – gone steadily down in the last ten years; overseas, after sliding down following Harry Potter and the Chamber of Secrets, figures have remained relatively constant. Note: Inflation-adjusted figures are approximations so one can have an idea about the number of tickets each Harry Potter movie sold. That's the true parameter of a movie's box office success. Regarding the international box office, it's also worth noting that a decade ago neither China nor Russia were the box office behemoths they have become since. And of course, inflationary pressures vary from country to country. And finally, bear in mind that currency fluctuations can have a major impact on international figures once they are converted to US dollars. Apart from a bump during the height of the global economic crisis of late 2008-early 2009, the dollar was considerably stronger ten years ago than it is now; in other words, foreign revenues for Harry Potter and the Sorcerer's Stone would be impacted negatively when converted to US dollars when compared to those for Harry Potter and the Deathly Hallows: Part 1. Directed by David Yates, and adapted by Steve Kloves from J.K. Rowling's novel, Harry Potter and the Deathly Hallows: Part 2 features the aforementioned Daniel Radcliffe, Emma Watson, and Rupert Grint, in addition to Ralph Fiennes, Helena Bonham Carter, Jason Isaacs, Emma Thompson, Gary Oldman, Tom Felton, Michael Gambon, John Hurt, Maggie Smith, Robbie Coltrane, Kelly Macdonald, Ciaran Hinds, David Thewlis, Timothy Spall, Miranda Richardson, Julie Walters, Alan Rickman, Jim Broadbent, Warwick Davis, and Miriam Margolyes. 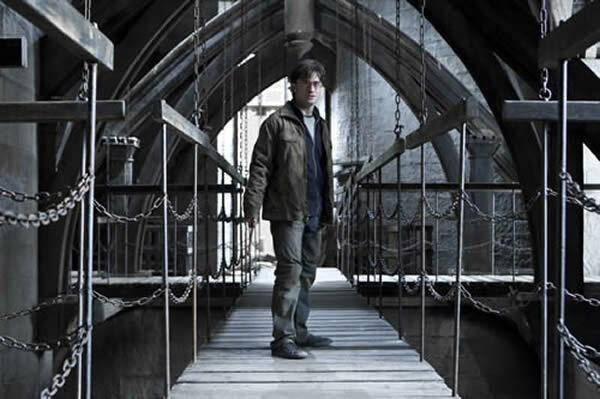 Harry Potter and the Deathly Hallows: Part 2 has been breaking box office records in a number of countries. Will it become the most popular Harry Potter movie ever? It's certainly a possibility, though – 3D surcharges aside – it'll have to sell more tickets than the most successful Harry Potter to date – the very first installment in the Harry Potter series, Harry Potter and the Sorcerer's Stone, released in November 2001. Adjusted for inflation, Sorcerer's Stone remains by far the most popular movie in the Harry Potter franchise in terms of attendance, both in North America and internationally. Steve Kloves has been the “official” adapter of J.K. Rowling's Harry Potter books. The Harry Potter directors have been Chris Columbus (the first two movies), Alfonso Cuarón (Harry Potter and the Prisoner of Azkaban), Mike Newell (Harry Potter and the Goblet of Fire), and David Yates (the last four movies). In addition to leads Daniel Radcliffe, Emma Watson, and Rupert Grint, the Harry Potter movies have featured an array of (mostly) British stars, old and new. Among them: Ralph Fiennes, Julie Christie, Helena Bonham Carter, Jason Isaacs, Emma Thompson, Tom Felton, Michael Gambon, John Hurt, Maggie Smith, Robert Pattinson, Imelda Staunton, Robbie Coltrane, Richard Griffiths, Frances de la Tour, Shirley Henderson, and Kelly Macdonald. Also: Ciaran Hinds, Zoë Wanamaker, David Thewlis, Timothy Spall, John Hurt, Fiona Shaw, Ian Hart, Miranda Richardson, Julie Walters, Dawn French, Bonnie Wright, Jessie Cave, Geraldine Somerville, Helen McCrory, Gary Oldman, Jim Broadbent, Brendan Gleeson, Warwick Davis, Richard Harris, John Cleese, Oliver Phelps, and Miriam Margolyes. Below is the domestic, international, and worldwide box office chart of the Harry Potter movies. Box Office Mojo's “ticket-price inflation chart” was used to adjust domestic box office figures. The US Labor of Statistics' inflation chart was used to adjust international figures.